This amazing writing table will create a sophisticated arrangement in your home office. 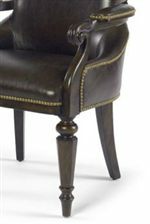 It features distinct turned legs and a wide oval top. The rich cognac finish further accentuates the lovely appeal of this piece. Get your work done with ease using this fantastic writing table. The Chelsea Club Monk's House Writing Table by Century at AHFA in the area. Product availability may vary. Contact us for the most current availability on this product.